In a bout that had good wrestling and a decent reaction from the crowd, Yuji Nagata defeated Masato Tanaka in 13:36 by pinfall with a Backdrop Suplex. In a terrible match, Gedo defeated Tama Tonga in 5:39 by submission with a Gedo Clutch. In a poor match, Takashi Iizuka defeated Tomohiro Ishii and BUSHI in 11:39 when Takashi Iizuka defeated BUSHI by pinfall with a Jigoku Tsuki. In a bout that had decent wrestling but little heat, Minoru Suzuki defeated Captain New Japan, Hiromu Takahashi and Shelton Benjamin in 9:39 when Minoru Suzuki defeated Hiromu Takahashi by pinfall with a Gotch-Style Piledriver. In a bout that had terrible wrestling and non-existent crowd heat, Taka Michinoku defeated King Fale in 7:49 by pinfall with a Michinoku Driver II. In a bout that had decent wrestling but didn't have much heat, Shinsuke Nakamura defeated Kyosuke Mikami in 8:27 by pinfall with a Boma Ye. Shinsuke Nakamura makes defence number 2 of his IWGP Intercontinental title. In a decent match, Prince Devitt defeated Taichi in 16:23 by pinfall with a Prince's Throne. Prince Devitt makes defence number 3 of his IWGP Junior Heavyweight title. In a bout that had decent wrestling but little heat, Killer Elite Squad defeated Forever Hooligans in 14:10 when Lance Archer defeated Alex Koslov by pinfall with a Boot From Hell. 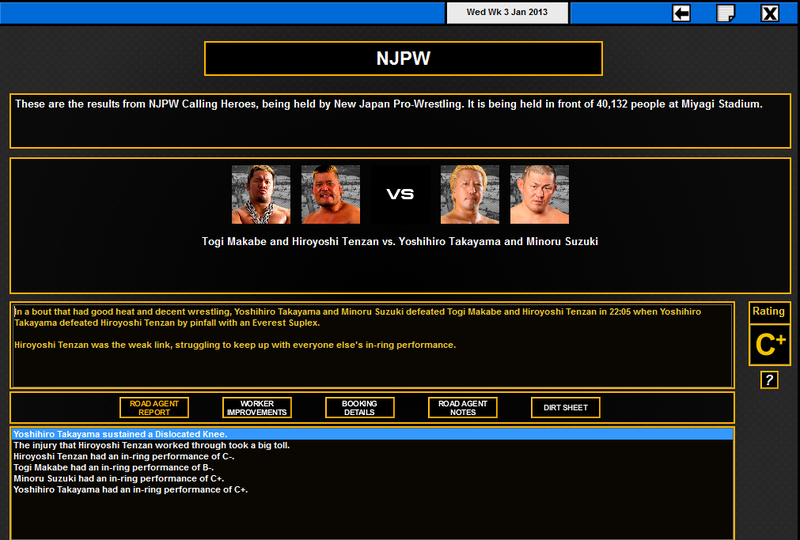 Killer Elite Squad make defence number 2 of their IWGP Tag Team titles. In a bout that had good heat and decent wrestling, Yoshihiro Takayama defeated Hirooki Goto in 14:54 by pinfall with an Everest Suplex. In a bout that had great wrestling and good heat, Hiroshi Tanahashi defeated Toru Yano in 15:02 by pinfall with a High Fly Flow. Hiroshi Tanahashi makes defence number 2 of his IWGP Heavyweight title. In a pre-show bout that had decent wrestling but didn't have much heat, Chaos World Wrestling Warriors defeated Lance Archer and Tomohiro Ishii in 11:57 when Low Ki defeated Tomohiro Ishii by pinfall with a Ghetto Stomp. Low Ki carried the match in terms of in-ring performance. 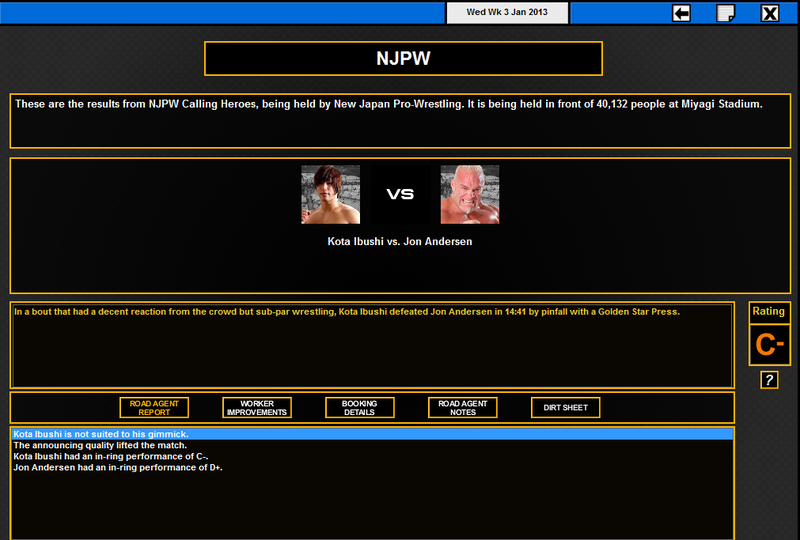 In a bout that had sub-par wrestling and little heat, Jon Andersen defeated BUSHI in 10:20 by pinfall with a Chokeslam. In a bout that had decent wrestling but didn't have much heat, Montel Vontavious Porter defeated Davey Boy Smith Jr in 10:23 by pinfall with a Malicious Intent. In a terrible match, Taka Michinoku defeated Kyosuke Mikami in 10:08 by pinfall with a Michinoku Driver II. 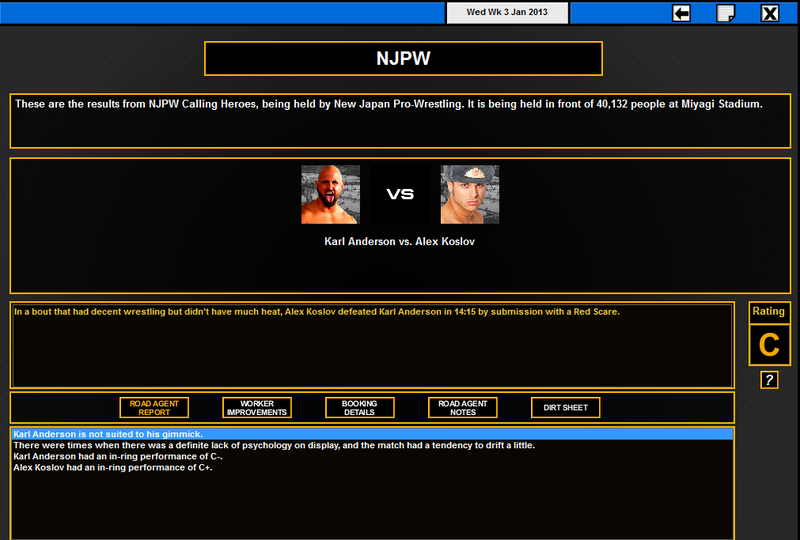 In a bout that had sub-par wrestling and little heat, Alex Koslov defeated Karl Anderson in 7:37 by submission with a Red Scare. In a decent match, Yujiro Takahashi defeated Kota Ibushi in 13:59 by pinfall with an Intercollege Slam. In a bout that didn't have much heat and terrible wrestling, Taichi defeated Nobuo Yoshihashi in 9:57 by pinfall with a Black Mephisto. In a decent match, Shinsuke Nakamura defeated Captain New Japan in 16:25 by pinfall with a Boma Ye. Shinsuke Nakamura makes defence number 3 of his IWGP Intercontinental title. In a decent match, Prince Devitt defeated Rocky Romero in 12:12 by pinfall with a Prince's Throne. Prince Devitt makes defence number 4 of his IWGP Junior Heavyweight title. In a decent match, TenKoji defeated Gedo and Jado in 14:47 when Satoshi Kojima defeated Jado by pinfall with a Koji Cutter. In terms of in-ring work, Satoshi Kojima was head and shoulders above everyone else. In a bout that had great wrestling and good heat, Hiroshi Tanahashi defeated Toru Yano in 15:25 by pinfall with a High Fly Flow. Hiroshi Tanahashi makes defence number 3 of his IWGP Heavyweight title. In a bout that had decent wrestling but little heat, The Time Splitters defeated Forever Hooligans in 12:25 when Alex Shelley defeated Alex Koslov by pinfall with a Shellshock. The Time Splitters make defence number 2 of their IWGP Junior Heavyweight Tag Team titles. In terms of in-ring work, Alex Shelley was head and shoulders above everyone else. KUSHIDA was the weak link, struggling to keep up with everyone else's in-ring performance. A freestyle segment called 'Brawl involving Hirooki Goto and Shinsuke Nakamura' featuring Hirooki Goto and Shinsuke Nakamura. In a bout that had decent wrestling but didn't have much heat, Gedo and Jado defeated Killer Elite Squad in 10:01 when Jado defeated Davey Boy Smith Jr by submission with a Crossface Of JADO. Gedo and Jado win the IWGP Tag Team titles. In a bout that had decent wrestling but didn't have much heat, Masato Tanaka, Minoru Suzuki and Ryusuke Taguchi defeated Nobuo Yoshihashi, Karl Anderson and BUSHI in 12:04 when Minoru Suzuki defeated Karl Anderson by submission with a Saka Otoshi. In a bout that had sub-par wrestling and little heat, Shelton Benjamin defeated Kota Ibushi and Hiromu Takahashi in 12:29 when Shelton Benjamin defeated Hiromu Takahashi by pinfall with a Paydirt. Hiromu Takahashi was the weak link, struggling to keep up with everyone else's in-ring performance. In a terrible match, Taichi defeated King Fale in 10:11 by pinfall with a Black Mephisto. A freestyle segment called 'Pre-match interview with Yujiro Takahashi' featuring Yujiro Takahashi. In a decent match, Wataru Inoue defeated Yujiro Takahashi in 15:49 by pinfall with an Oracion Flame. A freestyle segment called 'Hype video involving Prince Devitt and Taka Michinoku' featuring Prince Devitt (Off Screen) and Taka Michinoku (Off Screen). In a decent match, Prince Devitt defeated Taka Michinoku in 15:24 by pinfall with a Prince's Throne. Prince Devitt makes defence number 5 of his IWGP Junior Heavyweight title. A freestyle segment called 'Skit involving Hiroshi Tanahashi and Yuji Nagata' featuring Hiroshi Tanahashi and Yuji Nagata. In a bout that had great heat and good wrestling, Yuji Nagata defeated Yoshihiro Takayama in 21:51 by pinfall with a Backdrop Suplex. A freestyle segment called 'Hype video involving Hiroshi Tanahashi and Shinsuke Nakamura' featuring Hiroshi Tanahashi (Off Screen) and Shinsuke Nakamura (Off Screen). In a bout that had superb wrestling and great heat, Shinsuke Nakamura defeated Hiroshi Tanahashi in 21:57 by pinfall with a Boma Ye. Shinsuke Nakamura wins the IWGP Heavyweight title. In a pre-show bout that had sub-par wrestling and little heat, Lance Archer defeated Kyosuke Mikami in 7:36 by pinfall with a Boot From Hell. 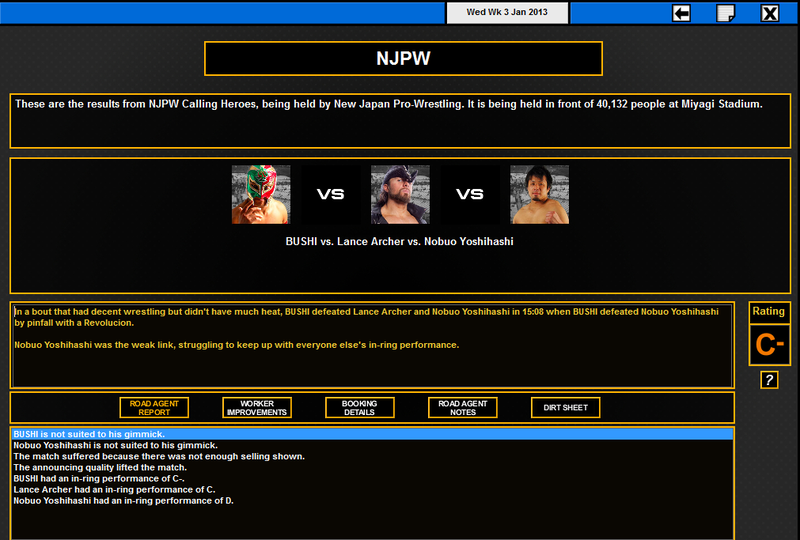 In a bout that had great wrestling and a decent reaction from the crowd, Blue Justice Army I defeated Gedo and Jado in 15:01 when Yuji Nagata defeated Jado by pinfall with a Backdrop Suplex. Blue Justice Army I win the IWGP Tag Team titles. In terms of in-ring work, Yuji Nagata was head and shoulders above everyone else. 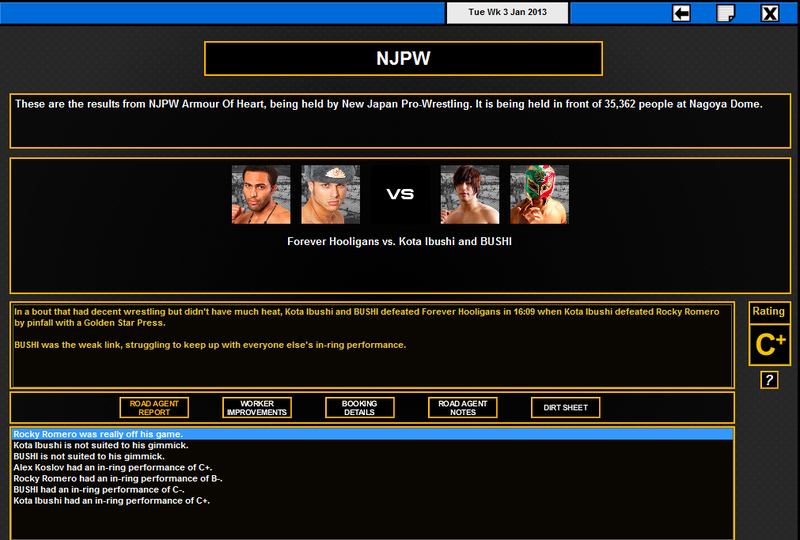 Gedo was the weak link, struggling to keep up with everyone else's in-ring performance. In a decent match, Tiger Mask, Kota Ibushi and Alex Shelley defeated Jon Andersen, Tomohiro Ishii and Yujiro Takahashi in 16:11 when Kota Ibushi defeated Jon Andersen by pinfall with a Golden Star Press. In a bout that had decent wrestling but didn't have much heat, Low Ki defeated Taka Michinoku in 15:24 by pinfall with a Ghetto Stomp. In a decent match, Hiroyoshi Tenzan defeated Takashi Iizuka in 15:15 by pinfall with a TTD. In a bout that had good heat and decent wrestling, Hirooki Goto defeated Minoru Suzuki in 14:35 by submission with a Shoryu Kekkai. In a bout that had great wrestling and a decent reaction from the crowd, Togi Makabe defeated Masato Tanaka in 15:30 by pinfall. 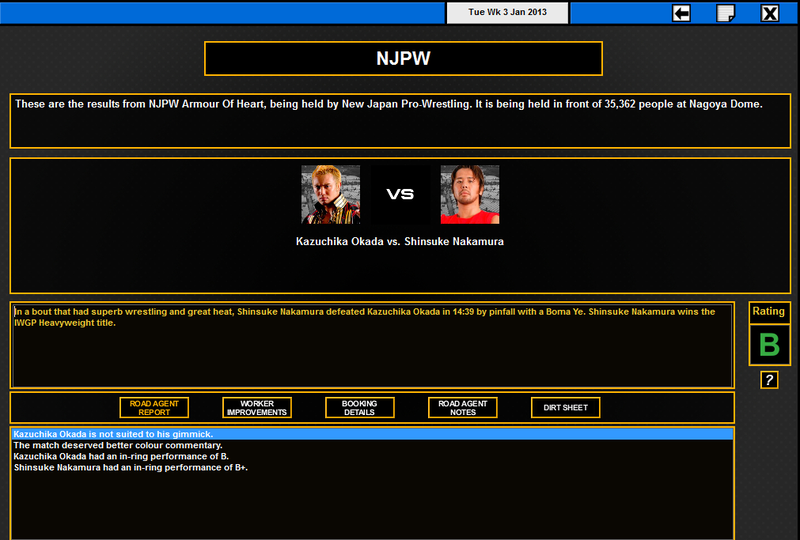 In a decent match, Prince Devitt defeated Taichi in 19:36 by pinfall with a Prince's Throne. Prince Devitt makes defence number 6 of his IWGP Junior Heavyweight title. In a superb match, Hiroshi Tanahashi defeated Yoshihiro Takayama in 21:38 by pinfall with a High Fly Flow. In a superb match, Kazuchika Okada defeated Satoshi Kojima, Toru Yano and Shinsuke Nakamura in 21:49 when Kazuchika Okada defeated Toru Yano by pinfall with a Rainmaker. Kazuchika Okada wins the IWGP Heavyweight title. Toru Yano was the weak link, struggling to keep up with everyone else's in-ring performance. In a terrible match, Minoru Suzuki defeated Tama Tonga in 10:21 by submission with a Saka Otoshi. In a bout that had great wrestling and a decent reaction from the crowd, Hiroshi Tanahashi defeated Alex Koslov in 14:05 by pinfall with a High Fly Flow. In a bout that had good wrestling and a decent reaction from the crowd, Prince Devitt defeated Rocky Romero in 16:04 by pinfall with a Prince's Throne. Prince Devitt makes defence number 7 of his IWGP Junior Heavyweight title. In a good match, Hirooki Goto drew with Yoshihiro Takayama in 15:00 when the time limit expired. In a superb match, Kazuchika Okada defeated Shinsuke Nakamura in 14:50 by pinfall with a Rainmaker. Kazuchika Okada makes defence number 1 of his IWGP Heavyweight title. In a terrible pre-show match, Taichi defeated Hiromu Takahashi in 10:25 by pinfall with a Black Mephisto. In a decent match, Ryusuke Taguchi defeated Tomohiro Ishii in 10:17 by pinfall with a Dodon. In a decent match, Tiger Mask defeated Jon Andersen in 14:48 by pinfall with a Tiger Suplex '09. 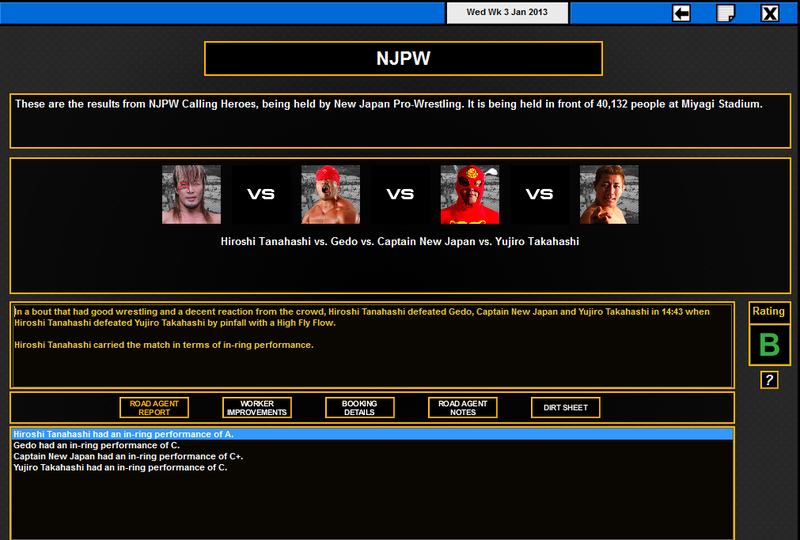 In a decent match, Yujiro Takahashi defeated Taka Michinoku, Captain New Japan and Low Ki in 14:09 when Yujiro Takahashi defeated Captain New Japan by pinfall with an Intercollege Slam. In terms of in-ring work, Low Ki was head and shoulders above everyone else. Taka Michinoku was the weak link, struggling to keep up with everyone else's in-ring performance. In a bout that had decent wrestling but little heat, The Time Splitters defeated Forever Hooligans in 12:08 when Alex Shelley defeated Rocky Romero by pinfall with a Shellshock. The Time Splitters make defence number 3 of their IWGP Junior Heavyweight Tag Team titles. In a decent match, Wataru Inoue defeated Montel Vontavious Porter in 15:57 by pinfall with an Oracion Flame. In a bout that had good wrestling and a decent reaction from the crowd, TenKoji defeated Gedo and Jado in 14:37 when Satoshi Kojima defeated Gedo by pinfall with a Koji Cutter. In a decent match, Hirooki Goto defeated Takashi Iizuka in 14:45 by submission with a Shoryu Kekkai. In a bout that had superb wrestling and good heat, Hiroshi Tanahashi defeated Masato Tanaka in 14:44 by pinfall with a High Fly Flow. In a good match, Kazuchika Okada defeated Toru Yano in 15:03 by pinfall with a Rainmaker. Kazuchika Okada makes defence number 2 of his IWGP Heavyweight title. In a bout that had terrible wrestling and non-existent crowd heat, Kyosuke Mikami defeated King Fale in 5:35 by pinfall with a Shoulder Tackle. In a decent match, Ryusuke Taguchi defeated Shelton Benjamin in 14:59 by pinfall with a Dodon. In a bout that had decent wrestling but didn't have much heat, The Time Splitters defeated Forever Hooligans in 13:34 when Alex Shelley defeated Alex Koslov by pinfall with a Shellshock. The Time Splitters make defence number 4 of their IWGP Junior Heavyweight Tag Team titles. In a decent match, Montel Vontavious Porter defeated Kota Ibushi in 13:35 by pinfall with a Malicious Intent. In a bout that had good wrestling and a decent reaction from the crowd, Shinsuke Nakamura defeated Captain New Japan in 16:08 by pinfall with a Boma Ye. Shinsuke Nakamura makes defence number 4 of his IWGP Intercontinental title. In a decent match, Wataru Inoue defeated Lance Archer in 9:43 by pinfall with an Oracion Flame. In a bout that had decent wrestling but didn't have much heat, Masato Tanaka and Jon Andersen defeated Chaos World Wrestling Warriors in 20:18 when Masato Tanaka defeated Spanky by pinfall with a Roaring Elbow. In a good match, Satoshi Kojima defeated Jado in 15:08 by pinfall with a Koji Cutter. In a good match, Kazuchika Okada defeated Toru Yano in 14:53 by pinfall with a Rainmaker. Kazuchika Okada makes defence number 3 of his IWGP Heavyweight title.